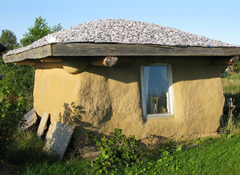 A Straw Bale Conch Shell Home in Fri & Fro EcoVillage, Denmark. 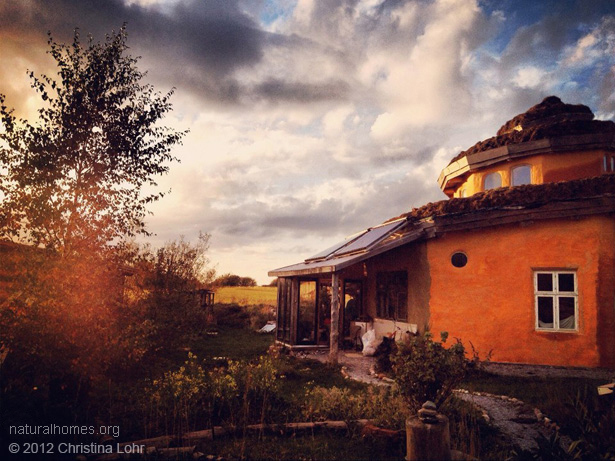 Poula-Line built her straw bale home in Fri & Fro (Free and Happy) ecoVillage in Egebjerg, Denmark. 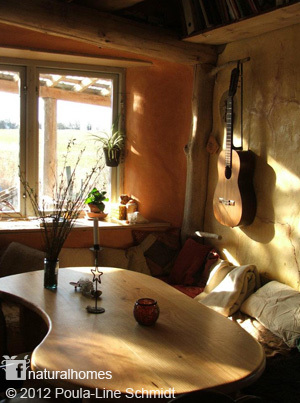 It's one of a collection of unique straw bale homes in the village. Her home was inspired by a conch shell she found on a beach in Malaysia. Poula, just like Rachel, lived in a small straw bale cabin on her land while she built her home. 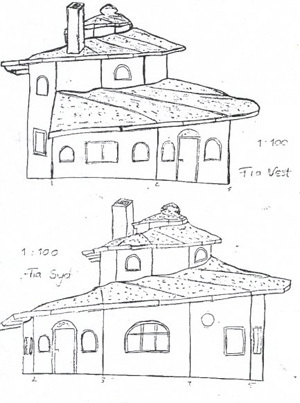 From the very start Poula had a vision of her home and made sketches (above) of the house she wanted to live in. 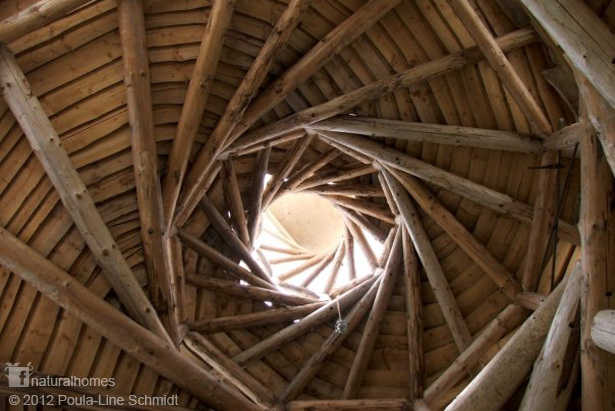 The structure of the home comes from its roundwood timber frame with a complex and very beautiful reciprocal roof with a seaweed cover like other Danish seaweed homes. 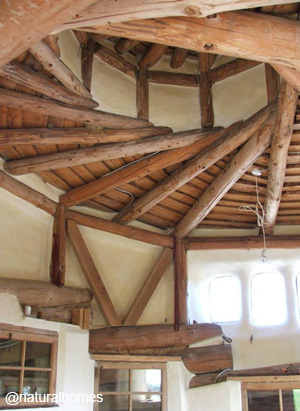 Between the roundwood timbers are straw bales with clay plaster and a clay floor with under floor heating. The house has a ground floor of 75 m2 and upstairs two small rooms in the spiral roof. She started building in the winter of 2005 on one of 16 plots in the village with one communal house and communal fruit garden. The village has natural homes in all shapes and sizes including one based on the shape of a Danish Liquorice. 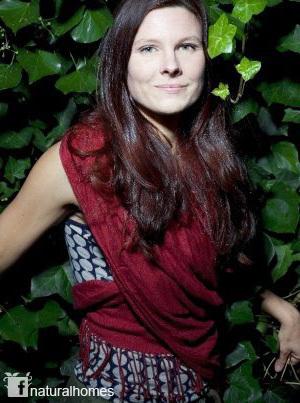 Poula is a certified permaculturist with lots of knowledge in all of the stages of natural building. She offers WWOOFers opportunities to join her to learn about organic food production and natural building. Anyone who joins her either stays in the small bedroom in the conch roof or in her original straw bale cabin which she calls the Smurf House. 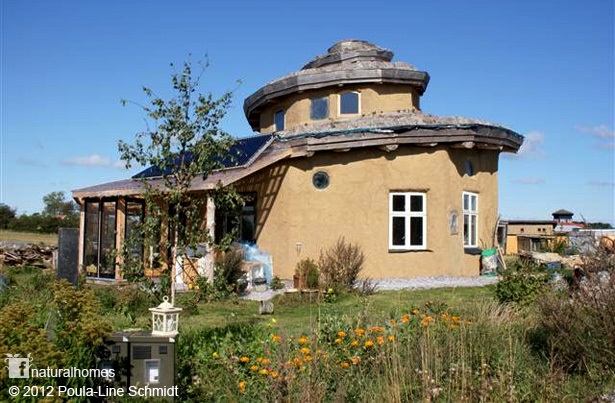 You can find Poula's straw bale home, and others in the ecoVillage, on the Natural Homes Map.